(Bloomberg) -- U.K. video game companies are on a tear, due to the growing number of online platforms bolstering revenue. Team17 Group Plc reported an almost 50 percent year-on-year growth in revenue Tuesday, and is now targeting potential acquisitions. “We’re in a very exciting industry, and it’s no secret growth in the games industry is phenomenal,” Team17 Chief Executive Officer Debbie Bestwick said in an interview, adding that retail “was a tough world” and digital distribution has been the major beneficial disruptor. Shares of Wakefield-based Team17 have risen about 44 percent since May, and of the five analyst recommendations tracked by Bloomberg, three maintain a buy position while two advise to hold. Investor confidence is similar for other British video-game companies that have held initial public offerings within the past 18 months. 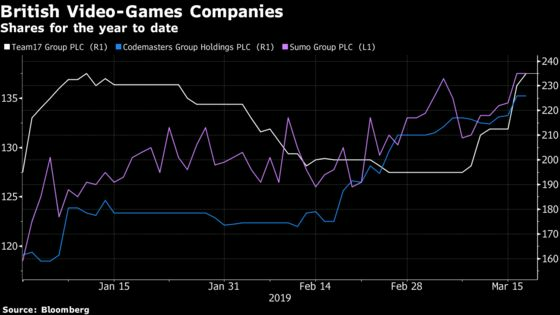 Shares of Codemasters Group Holdings Plc, whose IPO was in June, are up more than 40 percent for the year; Sumo Group Plc, public since December 2017, has gained 16 percent in the same period. The trend is being reflected across Europe too, with Rovio Entertainment Oyj, maker of the Angry Birds mobile games, up more than 53 percent since the start of the year, despite warning investors in February of lower profits for the first half of 2019. Bestwick said Team17 planned to use its “strong cash position” to acquire intellectual property, citing the successful purchase of Mouldy Toof Studios in 2016, the company whose hit game The Escapists was published by Team17. “We are looking, and we are quite proactive in that space,” she said. The growing competition between digital distribution channels is benefiting the company, the CEO said. One of Team17’s most recent releases, Genesis Alpha One, was exclusively sold on PC via the Epic Games store -- the platform created by the developer of the popular Fortnite game -- rather than Valve Corp.’s dominant Steam. Team17, which produces the popular Worms franchise, on Tuesday reported its first full-year earnings since its IPO ten months ago. Sales increased 46 percent for the year ended Dec. to 43.2 million pounds ($57.3 million), and adjusted earnings before taxes, interest, depreciation and amortization were up 18 percent to 15.3 million pounds. Britain was the sixth-largest video-game market globally in 2018 according to data compiled by Newzoo, with an estimated 37.3 million gamers collectively spending $4.5 billion. The U.K. is also the origin of some of the world’s best-selling games, such as Grand Theft Auto V, which came out of Scotland’s Rockstar North studio, and is the third-most popular game of all time with more than 100 million copies sold worldwide.